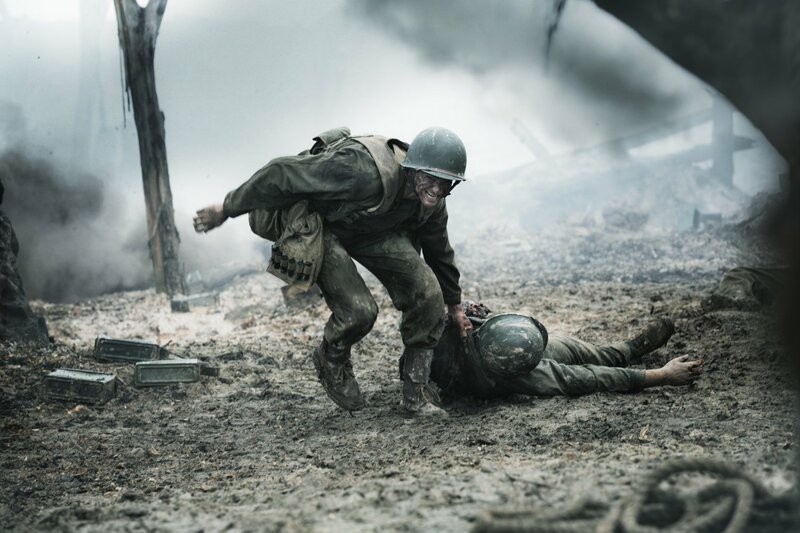 To cut to the core of whether to see Hacksaw Ridge, know that if you go you will see a war movie that is beautifully written, filmed, and acted. Know also that because it is so good, it is likely to stay with you in a deeply disturbing way long after leaving the theater. After he succeeds in becoming a legal conscientious objector, the story follows him through the horrific battle between the Japanese and the Americans on Okinawa in 1945. As you watch, remember that it all has the added strength of being the true story of the real Desmond Doss who is interviewed at the end of the movie. He is played in an extraordinary performance by Andrew Garfield. Garfield succeeds in showing us a gentle young man who, when challenged in battle, sticks to his principles at personal cost. He creates Doss as the gentle adult who was influenced by early and violent family encounters. As Doss, the young boy, actor Darcy Bryce makes us understand why. As does Hugo Weaving as Desmond’s father. Before enlisting, Doss loses his heart to Dorothy, a pretty young nurse (Rachel Griffiths) who quickly realizes “I fell in love with you because you weren’t like anyone else and you didn’t try to be.” The consistently convincing acting of Andrew Garfield turns Desmond Doss’s true story of saving lives on the battlefield into an entirely credible personal odyssey. He conveys beautifully the quiet strength of that young man’s deep beliefs. The battle is filmed in the heartbreaking realism of what happened to the soldiers during battle and after their deaths as they were carried back in bloody piles on truckbacks. It is during these grim scenes that we are struck by the futility and tragedy of lines of young men destroying each other on behalf of their two countries that were enemies at the moment but would become post-war allies. This isn’t the kind of movie where we can escape the power of the message by saying it didn’t happen that way. It did happen that way and there’s no way to escape that truth. What can we learn from it in a world that for the last fifty years has sent generations of boys to die in politically inspired wars that we later learned were mistakes? Korea, Vietnam? In yet another proof of a strong film, the truth of the story is the guarantee that we will leave the theater full of troubling thoughts that are not easily dismissed. And that is probably why Mel Gibson made this movie. This review was posted on November 12, 2016, in Biography, Drama, Romance. Bookmark the permalink.